Starting May 25, 2019 to September 2, 2019, six of Blue and Yellow line stations south of Ronald Reagan Washington National Airport will be closed for maintenance. As an alternative Metro plans to provide free express and local shuttle bus services to help customers get around the region. About 17,000 metro riders will be affected by this shutdown between Memorial Day and Labor Day weekend. Free express and local bus service will be provided while the stations are closed. Riders should plan additional 30 minutes of travel time to their commutes. 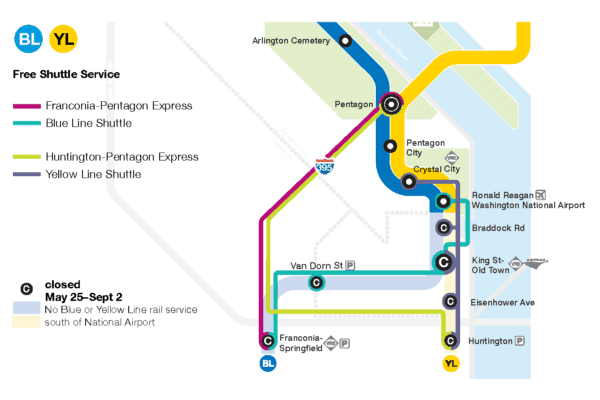 Two Pentagon Express shuttles from Franconia-Springfield Metro to the Pentagon and Huntington Metro to the Pentagon will be a great service. It may even have a good ridership like the new express routes such as 698, and 699 introduced along I-66 corridor. Challenge is the construction on I-395 express lanes and the Pentagon South Parking that may cause traffic backups that may impact commuters using HOV lanes. Telework option and lower summer traffic may washout the traffic due to metro shutdown. Hope Metro and PRTC considers to route few free express buses directly to Washington DC and Virginia State Police enforce HOV on 14th street bridge to elevate congestion at the Pentagon.